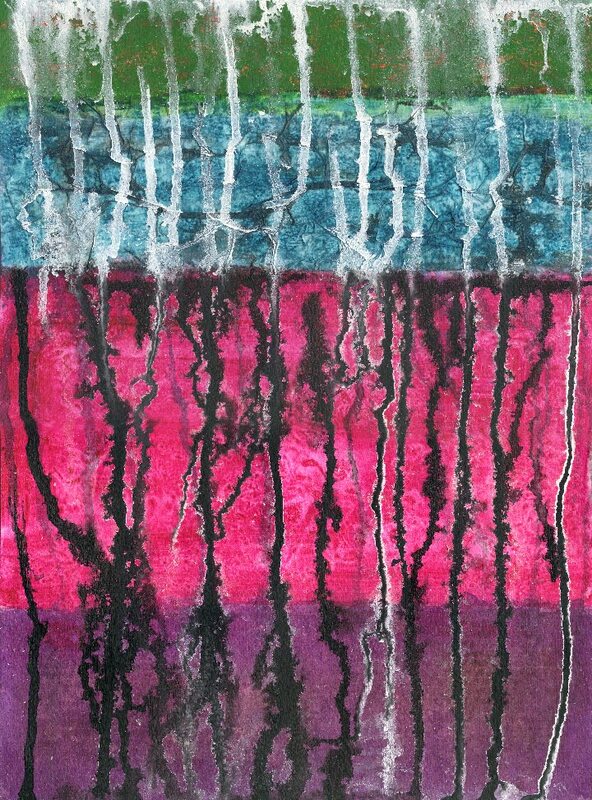 Watercolor paper, tissue paper, digital printout, acrylics, India ink, gesso. 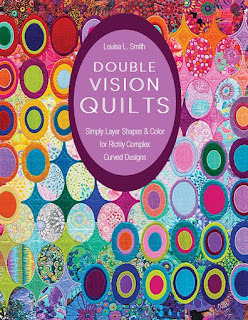 Would you like to try art quilting, but you're not sure where to start? Art Quilt Collage by Deborah Boschert shows you how to make works of art from bits of cloth, stitched motifs, and painted details. 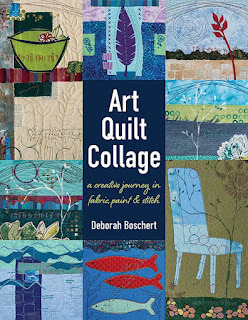 Deborah shares mixed-media techniques, practice exercises, checklists, and work-along projects that will help you unlock your own artistic vision as you quilt in a series, finish small art pieces, and incorporate meaningful symbols into your work. Published by C&T Publishing, the book is now ready for pre-order. A really awesome part of this book if you have not designed for yourself are the 8 design guides that Deborah suggests. 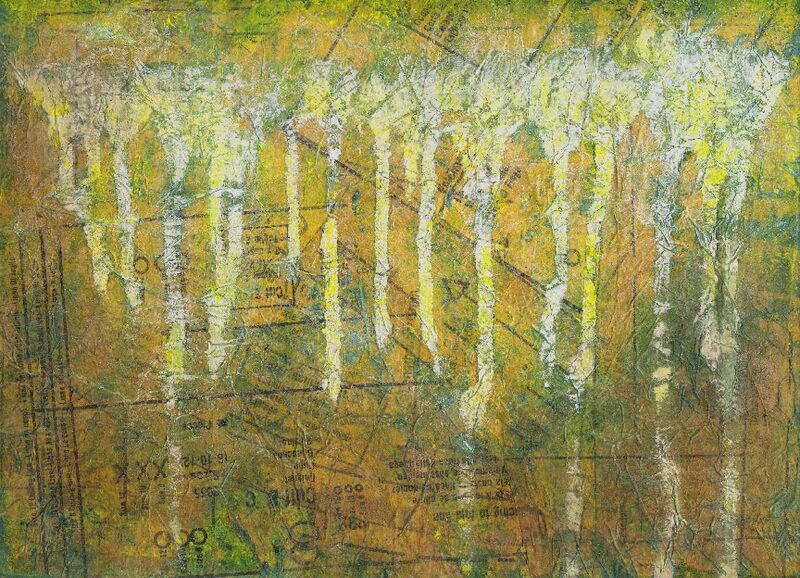 She calls them Landscape, Grid, Third Plus, Symmetrical, Magic Three, One Amazing Line, Dancing Grid, and Modular. She then also shows you how to create variations on each! No more fumbling with composition! 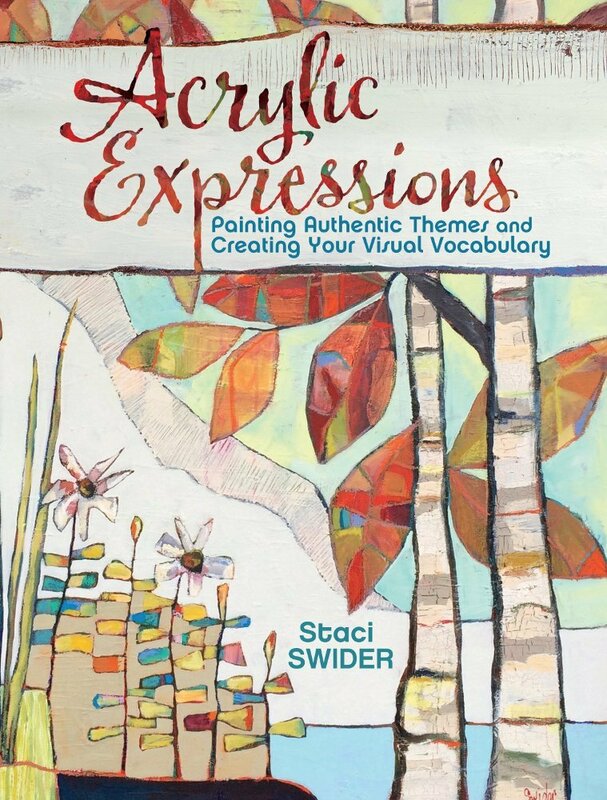 In addition, you will find chapters on adding personal symbols to your work, playing with surface design techniques, and of course, construction, stitching, and finishing! 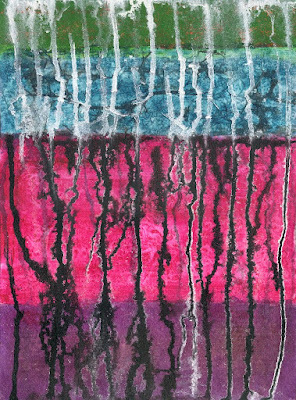 I used a couple of gesso resist painted papers that I made a long time ago, scanning them to create some of the layers in this digital piece. I love mixing physical painting and collage with digital. Did you know that there is a way to make circles and ovals from squares and rectangles without having to do any curved piecing? 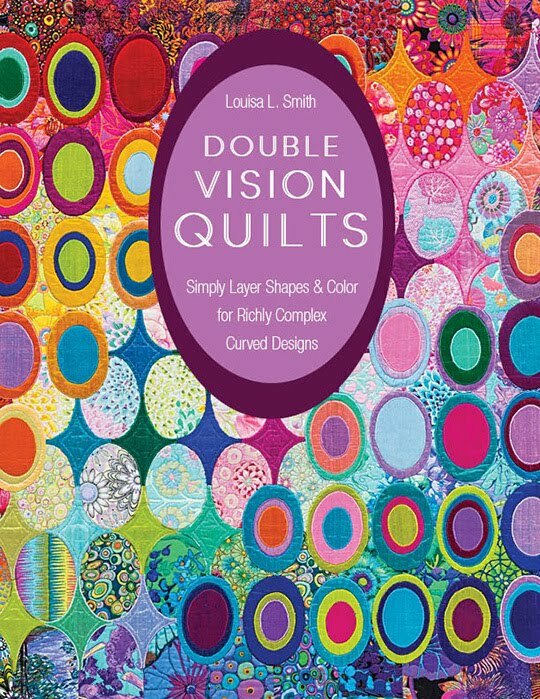 I am totally in love with Louisa L. Smith's techniques for layering and creating amazing patterns in Double Vision Quilts. Her mind-blowing colors don't hurt either! Published by C&T Publishing. North Light Books, publisher of beautiful art books, has another winner. Are you interested in learning how to paint more intuitively? Do you enjoy abstract designs, but haven't a clue how to approach painting them yourself? Staci Swider has written Acrylic Expressions to do just this: "This book is a collection of methods for working intuitively and organically in order to let paintings evolve rather than push a preconceived idea," states Staci in her introduction. To do this, Staci takes you through a series of demonstrations on how she works. Rather than trying to duplicate her pieces exactly, you are encouraged to think about your own favorite items, symbols, phrases, and such. 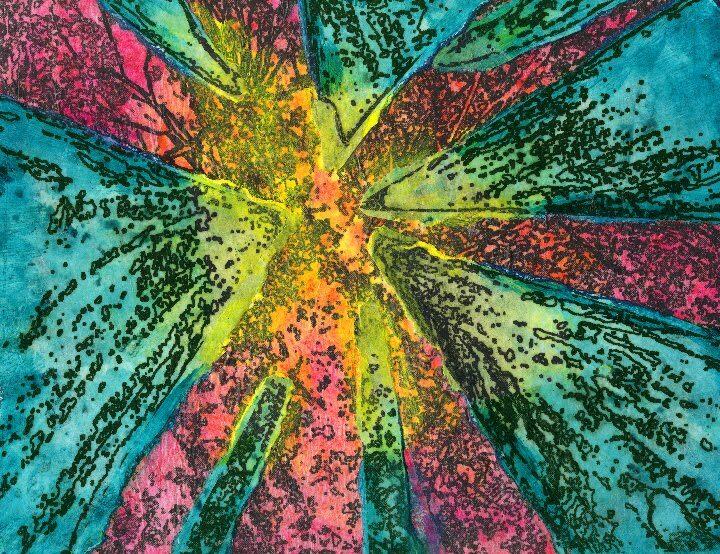 A typical project will have you laying down texture and color somewhat randomly, looking for what emerges and sketch-painting it in, and then filling in the background with colors that will make the showcased colors pop. It's an interesting approach, and can definitely be paired with planning rather than done completely randomly if that is your preference. Later on in the book, Staci tackles power tools and using unusually shaped pieces of wood as substrates. She also teaches you how to edge your piece with copper tape, which is a really nifty trick for giving the piece an "important" finished look. 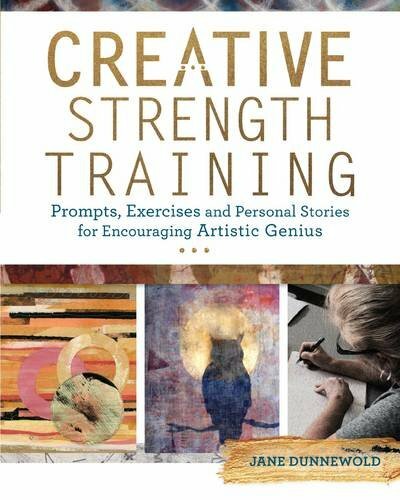 Even the first chapter is fun, covering tools, materials, color palettes, and texture-making products. 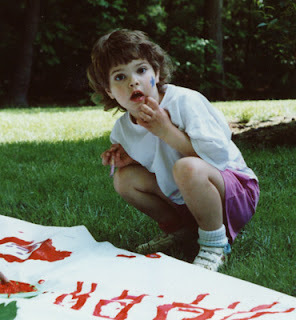 Acrylic paint mixed with dressmaker tissue, inks, and gesso. 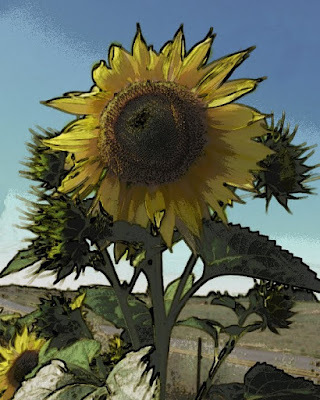 I took this shot of sunflowers slightly past their prime in Oregon a couple of years ago. I don't know about you, but sunflowers always make me happy! 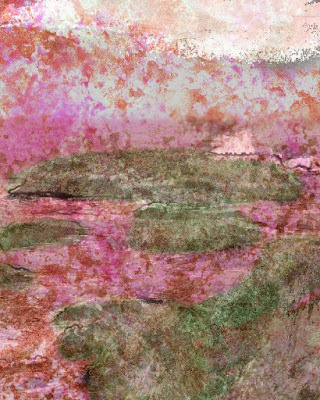 I added several layers in Photoshop, including a grayscale posterized layer and a thick edges layer.